A 4 hour intensive makeup workshop. At first there will be a step by step detailed demonstration which will teach you skills from basics to a professional from skin care to cover those dark circles to contour your face. After which we will be providing you with all the makeup products, brushes, mirrors, tools, creams etc. to create the same look that we created in class with every step. Personalised attention will be given to each student in each step of when they are practicing. We will also help to build your own makeup kit & give product recommendations. By the end of the event, you will receive a certification as well, followed by some food and drinks. What you wil learn? - skin care routine for different skin types - identification of brushes & its use products for different skin types - Signature base makeup - Choosing of Foundation and concealer shade - Foundation, concealing -correcting technique - how to cover dark circles -how to make the face look thin -2 types of eye looks -Eyeliner application - Brow filling - Sultry lips - Contouring - Highlighting - Blush application --> Demonstration class --> Practical experience, where all students will get to try the same look Miss Raashi created with her personalised attention. --> Use of high end products --> Q & A Question --> We will provide all the makeup, brushes , tools to practice within the class itself. 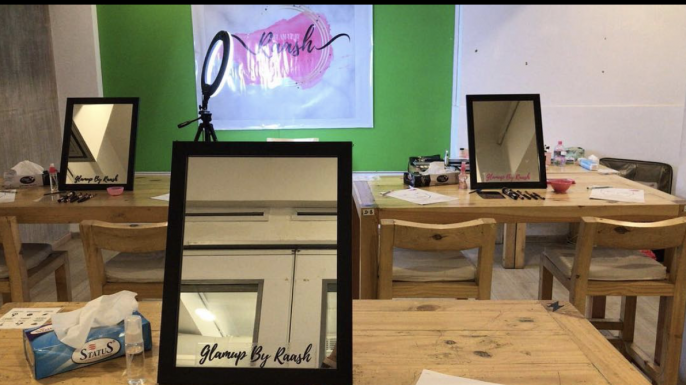 --> Certified course from GlamupbyRaash Academy. --> Writing material also provided to all the student !! Share "Self grooming makeup workshop"